Video from the LA Final Cut Pro User Group meeting I spoke at is now available for download via the Open Television Network. 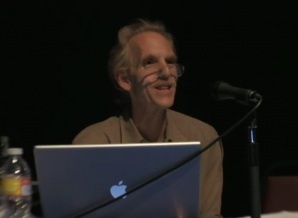 The meeting covered new features in MC 4.0 and featured presentations from me, Walter Murch and Shane Ross. Details are in this post. The video has been divided into three parts, one for each of the presenters. It’s not free, but the prices are minimal and the quality is excellent. Go to the LAFCPUG page on the Open Television Network and enter your credit card information. Click the link to subscribe to the feed via iTunes. Buttons for all recent episodes will appear in the iTunes podcast page. Take a look at the free previews or download each segment in full. It sounds like a hassle, but it worked well for me and only took a minute or two. You’ll get a signup discount of $5, so watching all three parts will cost you a whopping $2.47. This entry was posted on December 12, 2009 at 11:57 am and is filed under Apple, Avid, Avid Technical Tips, Avid vs. Final Cut, Final Cut. You can subscribe via RSS 2.0 feed to this post's comments. You can comment below, or link to this permanent URL from your own site. You look mighty distinguished in that picture Steve. Was an honor to have you at lafcpug Steve. You did an awesome job as usual. And for those that frequently ask why we charge money for past lafcpug meetings, (in the internet anything above free is expensive) and how we come up with the prices, it’s based on the length and content of the presentation, and we are a User Group who simply need the money to keep going. So when you do purchase these past meetings (and there are over 155 past segments) you are supporting the lafcpug. Thanks Michael — it was my pleasure to be there. Open TV Network, for what it’s worth, is trying something that I suspect we’ll see more of in the future — micro payments for narrow-cast video content. It’s a fair model, and I much prefer it to advertising.